Dr Peter Eson-Ozo, NLC General Secretary said this in an interview with newsmen on Monday in Abuja. Eson-Ozo said the Tripartite Committee on the New National Minimum Wage had concluded its meetings and a report of N30, 000 was agreed upon as the new minimum wage for Nigerian workers. NLC: You’ve my backing on planned nationwide protest, strike – Sen. Shehu Sani “The report has been submitted to Mr President and what we expect now from Mr President is to do justice to that report, by quickly raising an executive bill on the new National Minimum Wage. “And when that bill gets to the National Assembly, we want to assure Nigerian workers that we will be ready to engage them constructively,’’ he said. “We all signed up on the N30, 000, so why should there be any controversy,’’ he said. NAN reports that the Tripartite Committee on the new National Minimum Wage concluded its negotiation process on November 5 and submitted the report to Mr President on November 6. 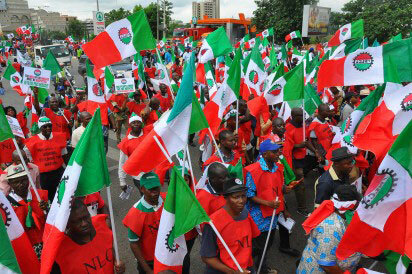 Minimum wage: Organised Labour frowns at FG delay tactics, embarks on protest Before then, the Federal Government had offered to pay N24, 000, while the organised labour had agreed with the Organised Private Sector (OPS) to stand on N30, 000 as the new National Minimum Wage. Newsmen further reports that President Buhari while receiving the committee report said “In a way, both arguments are valid. I want to assure you all that we will immediately put in place the necessary machinery that will close out these open areas. Our plan is to transmit the Executive Bill to the National Assembly for passage within the shortest possible time. I am fully committed to having a new National Minimum Wage Act in the very near future,’’ he said.